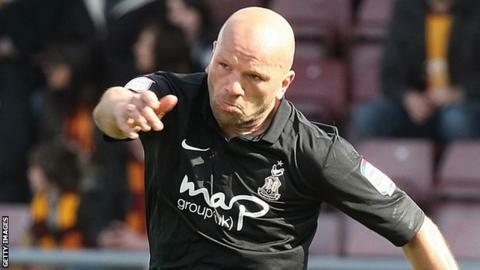 Aldershot Town defender Guy Branston says he understands the decision by fans to boo the side after their 1-0 home loss to Chesterfield. The Shots fell into the League Two relegation zone following the defeat. Branston told BBC Surrey: "I want the crowd to be passionate after we've won or after we've lost. "The crowd aren't happy to be relegation fodder. They want to be in the mix and have excitement. It's nice they get on at us and get involved." Aldershot have lost their last four league games and the 33-year-old centre-back has welcomed interaction from supporters at the EBB Stadium. "I'm not about the airy-fairy Olympics [idea of] clapping everyone just for kicking the ball," he added. "I don't want that. If we're not doing the right thing then make sure you get on at us. "I love reading about psychology and how it works on players. You get about five to six percent more out of the player if you get on at him. "Make sure you turn up in force and do that." Branston, who joined Aldershot on a free transfer this summer, says he has felt the effects of their recent run of form in his personal life. "I can't say across the board that every player is the same because we're all different personalities. "I know it hurts me. I go home and think about it. My missus moans because I can't switch off after a game. "I struggle sleeping because you think about certain things. I'll think about the goal, watch it back and work on it. I'll keep fighting tooth and nail."